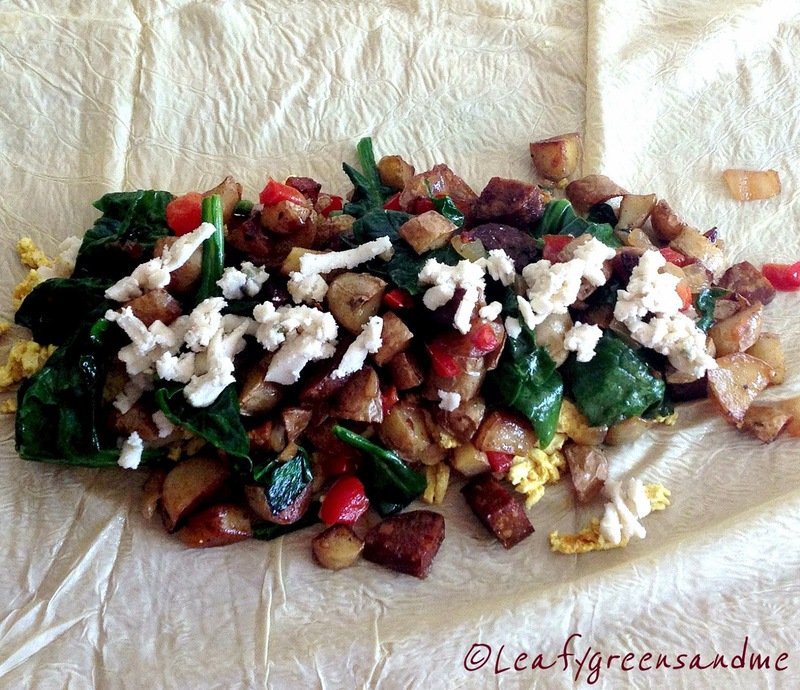 I love using yuba (tofu skins) because it is so versatile. It's great for wrapping/stuffing, stir-fry's and soups. You can purchase yuba at an Asian market, but I get mine freshly made at my local Sogo Tofu shop. This yuba omelet tasted like the real deal because I also added shredded firm tofu, mixed with turmeric and black salt found at my local Indian market. Black salt is an Indian spice that tastes like sulfur and imparts an "egg-like" flavor. It is "rose" in color instead of black and a little goes a long way because it is very salty! For the enchilada sauce, you can purchase store bought or make your own using my recipe. 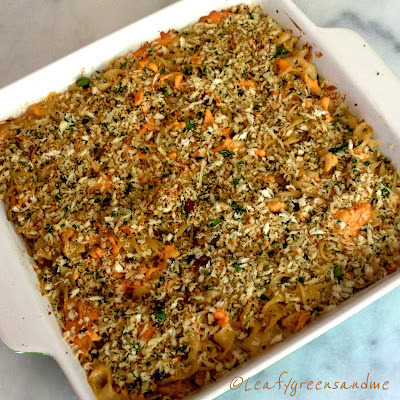 I cut the recipe in half for this dish, but if you want to make the full batch, you can store it in the fridge for a couple of weeks and use it for another meal. For my avocado emulsion I used: 1/2 large avocado, 1 cup water, 2 tbsp vegan sour cream, a handful of cilantro leaves, the juice from a 1/2 lemon or lime, and salt and pepper to taste--then blended until creamy. And now for the filling...the best part! I used everything that I love in an omelet or burrito. I pan roasted baby fingerling potatoes, and sauteed red bell pepper, onion and garlic. I also sauteed one link of Artisan Tofurky Andouille Sausages (had this in my fridge and wanted to use it up), but sauteed cremini mushrooms would of been my first choice. I then added fresh spinach, salt and pepper to the mix and cooked until just wilted. To assemble, I unwrapped the tofu skin. Depending on the size you may need to cut the tofu skin, but since they are rather thin I like to leave them big so that when I stuff, roll and wrap, I get double the coverage. I placed a layer of shredded Daiya Havarti Style Wedge on the bottom, followed by shredded tofu mixed with turmeric and black salt, followed by the potato/veggie mixture, topped with more cheese and wrapped it up like a burrito. I then added a little olive oil to a saute pan and browned on both sides before placing in a 350 degree oven for about 5 minutes just to make sure that it heated all the way through and golden brown. 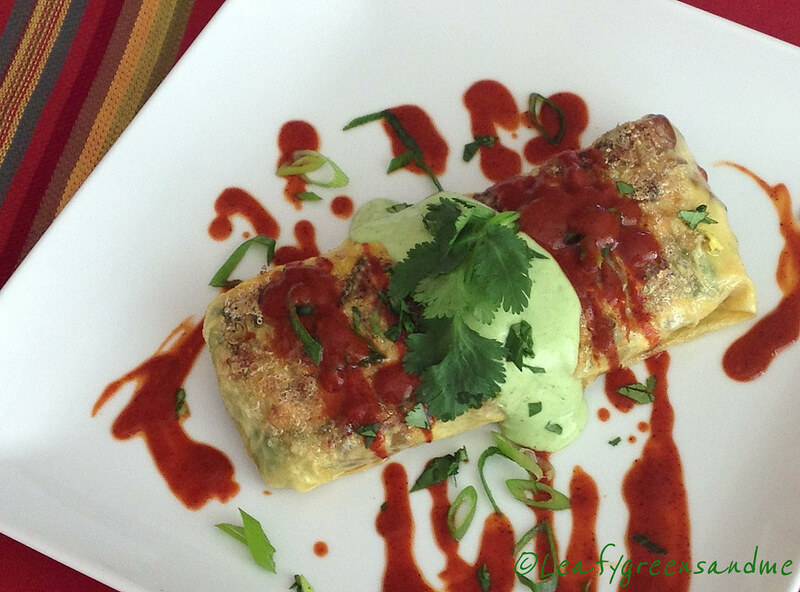 Remove from the oven and top with enchilada sauce, avocado emulsion, cilantro and finely sliced green onion. Perfect for breakfast, lunch or dinner...I could eat these every day stuffed with a different combination of ingredients and sauces! 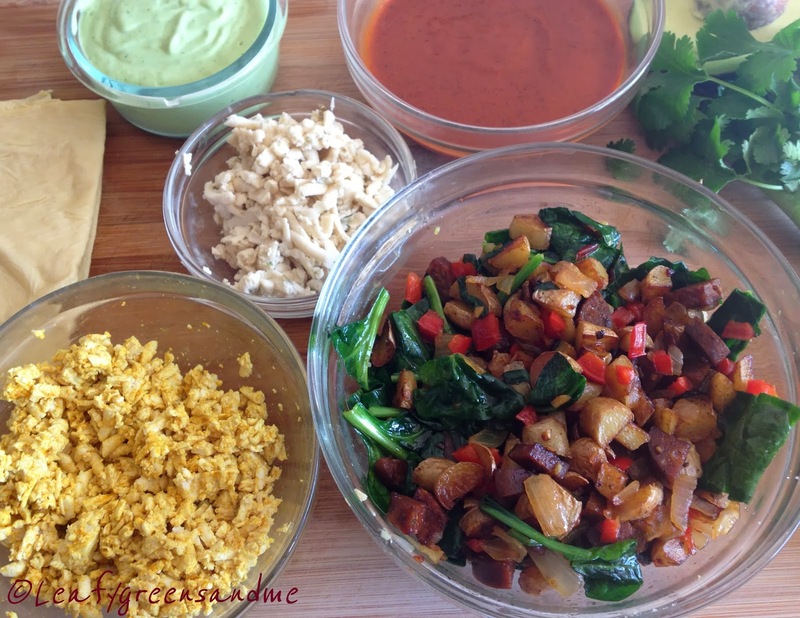 For my next one I'm going to stuff with a stir-fry mixture of fresh veggies, grilled teriyaki tofu and serve with Asian dipping sauces! YUM! I have made vegan burgers with just about every ingredient combination you can imagine (beans, mushrooms, rice, lentils, tempeh, TSP, nuts/seeds, gluten, etc.) and the texture is always off. They are very flavorful but they tend to be either mushy, gummy, crumbly, or dry and so when I saw these Beet Sliders featured on Diner's, Drive-In's and Dives the other day, I knew that I had to make them for the 49ers vs. Seahawks game yesterday. (Just a side note--bummed that the 9ers lost...:-(, but go Denver--I like Payton Manning--he's a classy guy!) Did you happen to notice that my sliders are the same colors as the 49ers uniforms...:-)! Anyway, back to the sliders. I served these with two sauces: a Dill-Green Goddess Aioli and a Tarragon-Spicy Mustard Aioli. The dill aioli was the favorite, but the tarragon-mustard was a close second--such a classic combination. To make the aioli dressings I used 1/2 cup Vegenaise and a 1/4 cup sour cream in each bowl. I then added finely minced dill, green onion and parsley to one bowl, and finely minced tarragon and spicy brown mustard to the other bowl. I added fresh lemon juice, salt and pepper to each and whisked until smooth. For the sliders, I purchased beets that were about 3" in diameter, all about the same size and I poached them in a liquid made up of: water, diced onion, carrots, celery, garlic cloves, fresh dill, fresh thyme, bay leaf, coriander seed, caraway seed, black peppercorns, and salt. I simmered them for about 1-1/2 hours until tender, let them cool, peeled them and with a 2-1/2" cookie cutter cut them the same size 1/4" thick. Before serving, I seared them in olive oil, salt and pepper, which gave them a great texture. The most difficult part about these sliders was locating the perfect size and textured bun. I went to Whole Foods, Trader Joes, Safeway and Lucky's and I purchased three different bags of buns, which are now taking up my freezer. I wanted them the exact size of my beets, but I didn't want the bread to be too dense. It all worked out and the beet to bun ratio was perfect! 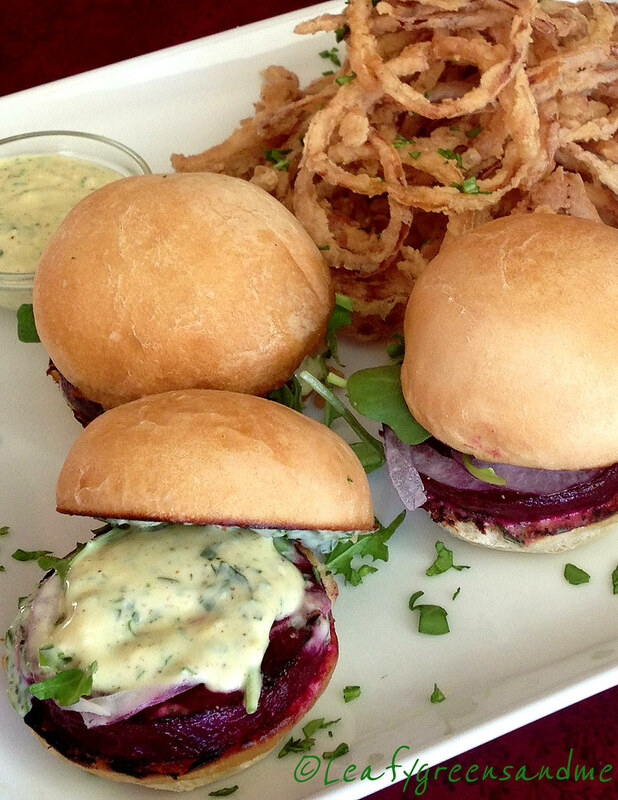 Finally, I shaved red onion very thin on a mandolin and topped each slider with onion, arugula and aioli of choice. I was thinking about serving them with fries but went with the crispy onion stings. I used one large sweet Maui onion (serves 2-3 people), shaved thinly on a mandolin and set up a dredging station (wet: 2 cups almond milk with 1/4 cup hot sauce, dry: 2 cups flour, 1/4 cup cornstarch, salt and pepper). Using a candy thermometer, I heated 1 qt canola oil to 380 degrees and deep fried the onion strings until golden brown, drained on paper towels and sprinkled with sea salt! These were so yummy and so easy to make that I will probably never go back to making burgers the other way! So I thought that I would post something really healthy since it is the beginning of the New Year and we all are trying to keep our resolutions to eat healthy. Actually, I really don't have any resolutions when it comes to food or diet. Maybe I could be a little more patient, procrastinate less, or take time to smell the tulips more often, but pretty much everyday I have a healthy juice, or a smoothie and some days this is all that I drink! I have never been able to go on a juice fast for more than 24 hours. However, I do try to eliminate all solid food from my diet at least several of times a month. I pick a Wednesday and drink only fresh vegetable juices and smoothies throughout the day, along with filtered water and herbal tea. If you drink only pure vegetable juice then you are eliminating fiber from your diet and so I try to drink both while on my 24 hour cleanse. Plus the smoothies keep you fuller longer. Here's a typical day: 6am (Herbal Tea with Lemon), 7am (Healthy Green Juice), 8am-11am (Herbal Tea and Water), 11am (Green Protein Power Smoothie) 12-2pm (Herbal Tea and Water), 2pm (Green Juice, Beet Blast or Crazy Carrot Juice), 3-5pm (Herbal Tea and Water) 6pm (Tropical Thunder Protein Smoothie), 7-9pm (Herbal Tea and Water). The following day I wake up feeling refreshed, lighter and energized. Perhaps just giving your digestive track a break from having to work so hard gives your body a needed lift. I'm not a nutritionist and long-term fasting is not for me, but I do believe that I benefit from drinking fresh vegetable juice daily and following a 24 hour cleanse. 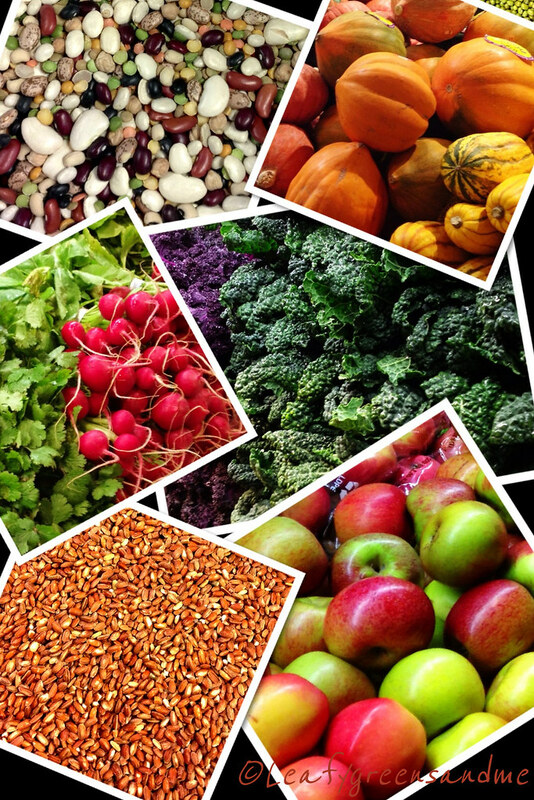 I like experimenting and throwing a bunch of veggies in a juicer or blender and tasting the outcome. Some come out horrible tasting but most are quite delicious. 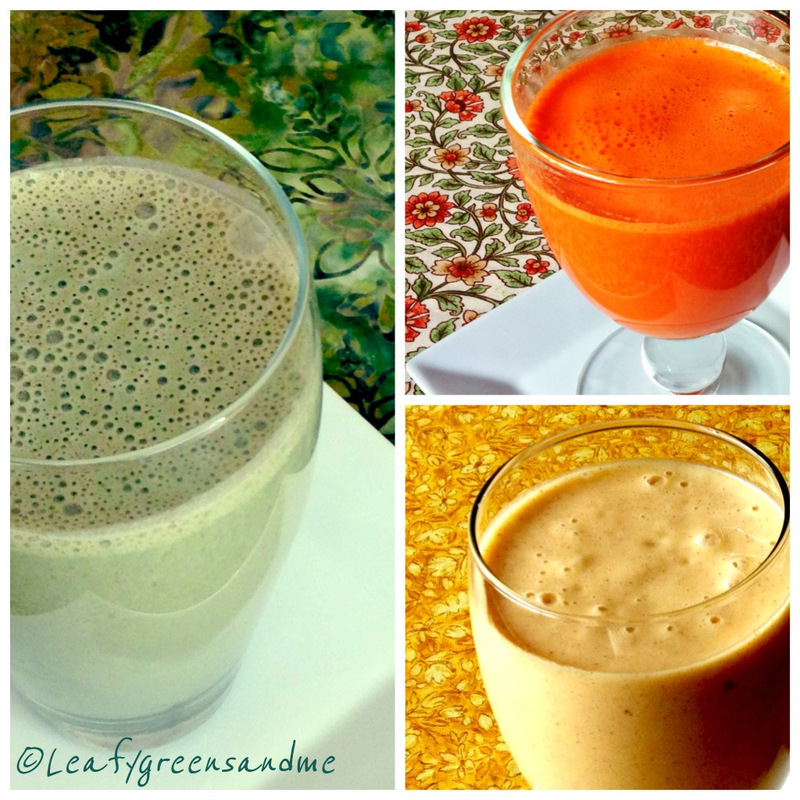 Here are a few of my favorite drinks--just please make sure that you use all organic ingredients--you don't want to drink pesticides! Tropical Thunder Power Smoothie: 1 cup coconut water, 1/2 banana, 1/2 cup frozen mango, 1/4 cup frozen pineapple, 2 tbsp soaked chia seeds. When drinking pure juice, I usually do not add any supplements, other than a 1 tsp of flax oil. Or after juicing I will add the juice to the blender, add a 1/2 avocado or 2 tbsp hemp seeds and blend. 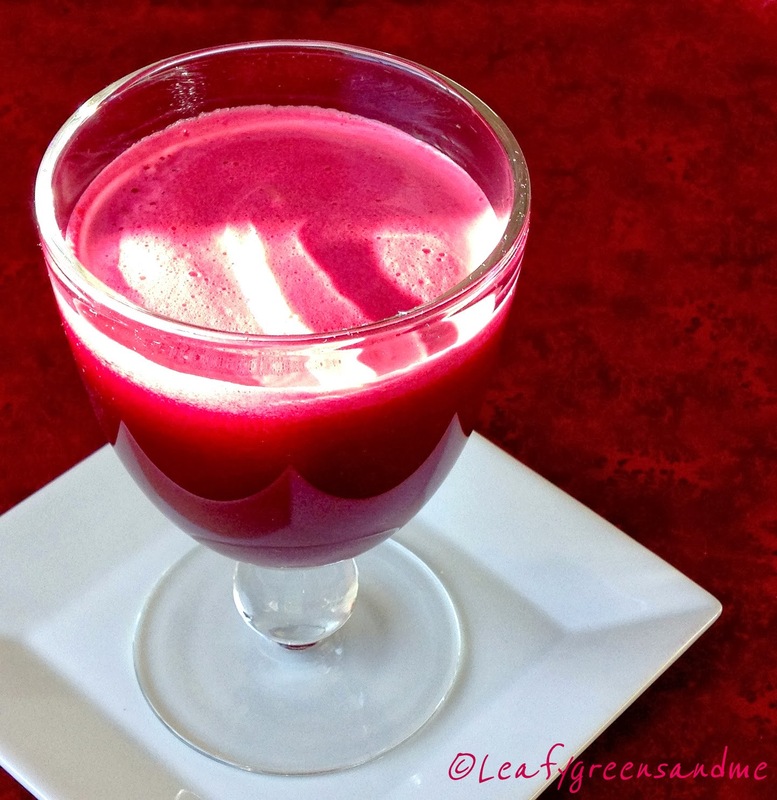 This adds fiber and protein to the juice and also gives it a creamy consistency. When drinking smoothies I add different supplements. My favorite supplements are by Health Force Nutritionals. 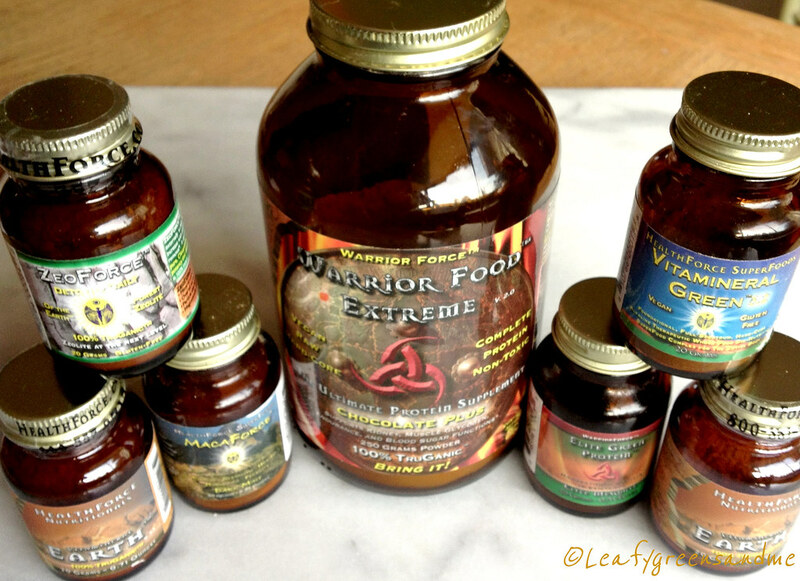 I use their Warrior Food Protein Powder, VitaMineral Green, Earth, Maca, Vitamin C, and Spirulina. All of their products are raw and I really like the taste--they do not taste gritty or gummy. I pick and choose depending on what benefit I want. I will also add soaked chia seeds or hemp seeds for protein/fiber and of course flaxmeal or flax oil. Also, I prefer drinking juice over smoothies and green smoothies made with kale and mango over pure fruit smoothies. I never drink smoothies made with strawberry or raspberry and prefer mango and peaches because they taste less sweet. To sweeten a smoothie I may also add soaked pitted dates, or pure maple syrup. When making a green smoothie, the ratio of veggie to fruit should be 3:1. And of course, all of this is not possible without a good juicer and a high-speed blender. I have a Breville Fountain Juicer and a VitaMix. I use them daily. It killed me to spend $400+ for a VitaMix and thought about owning one for years but it has been worth ever penny. I use it every day and hardly ever pull out my food processor. And one final note, I drink a shot of wheat grass daily, or try to at least a couple times per week. I usually make my own during the summer but choose to buy it during the winter because it can get moldy because of moisture. If you're interested in making your own this summer go to my link on "Growing Wheatgrass--My Liquid Sunshine"! It's really fun to make...the taste not so much, but I do believe that it is good for me! 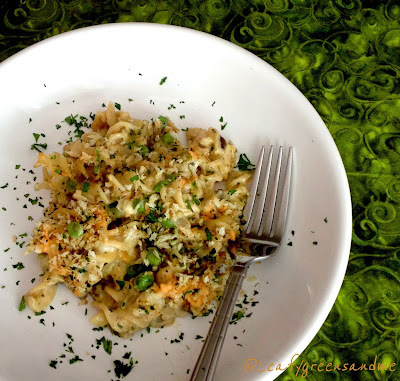 On Friday I'm always looking for a quick and easy dinner and this couldn't be simpler. You can make the white bean spread from scratch or doctor up your favorite white bean hummus. The key to this quesadilla is to make sure that the bean mixture is firm so that it is easy to cut. Top with a marinated salad of cherry tomatoes, arugula, capers and kalamata olives or eggplant capanata and drizzle with balsamic glaze. Saute onion, garlic and Italian seasoning and red pepper flakes until soft. In a food processor, process beans until mostly smooth, adding 1 tbsp of bean fluid or water. Remove bean mixture place in a bowl and stir in onion mixture and season with salt and pepper to taste. Add shredded cheese, bean mixture to tortilla and saute until golden brown. 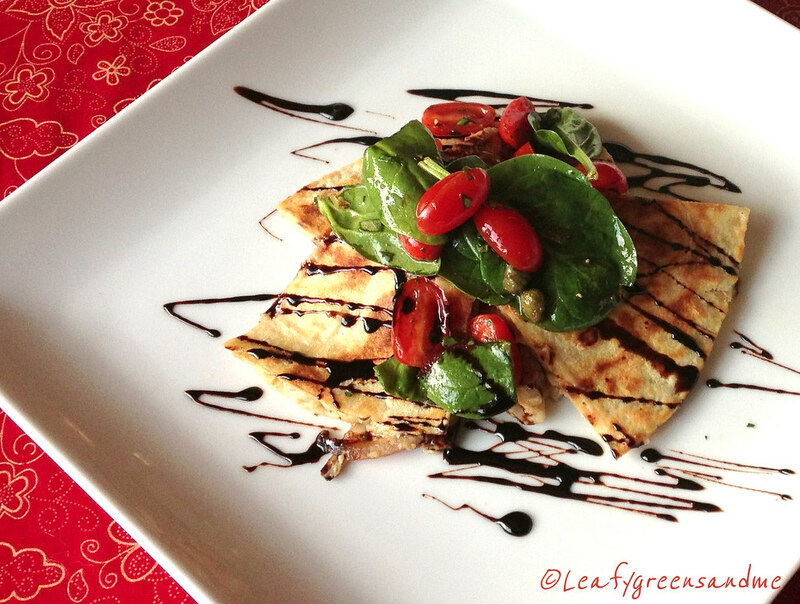 Cut into wedges and garnish with balsamic glaze and salad. I always have leftover pasta. My husband asks me why I cook the entire bag when it is only us. 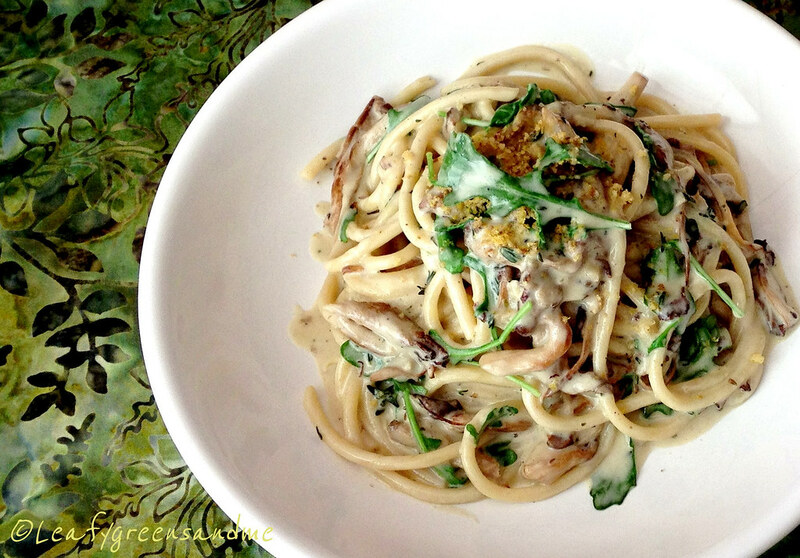 I love pasta and it's hard just to make a small amount. 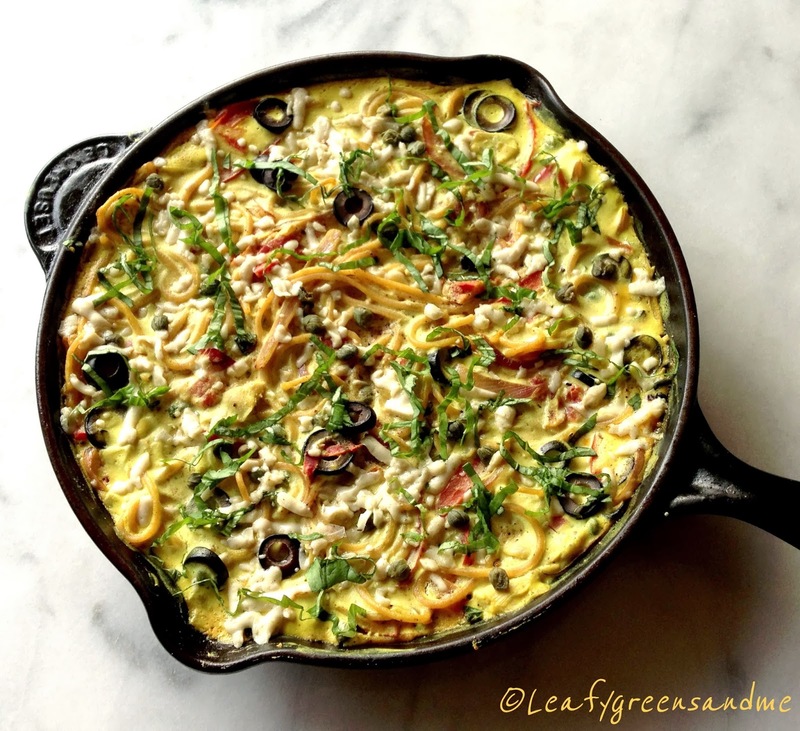 But not to worry because it never goes to waste when you can make a quick and easy weeknight spaghetti frittata! This frittata can be on the table in 45 minutes from start to finish and that is mostly for baking! 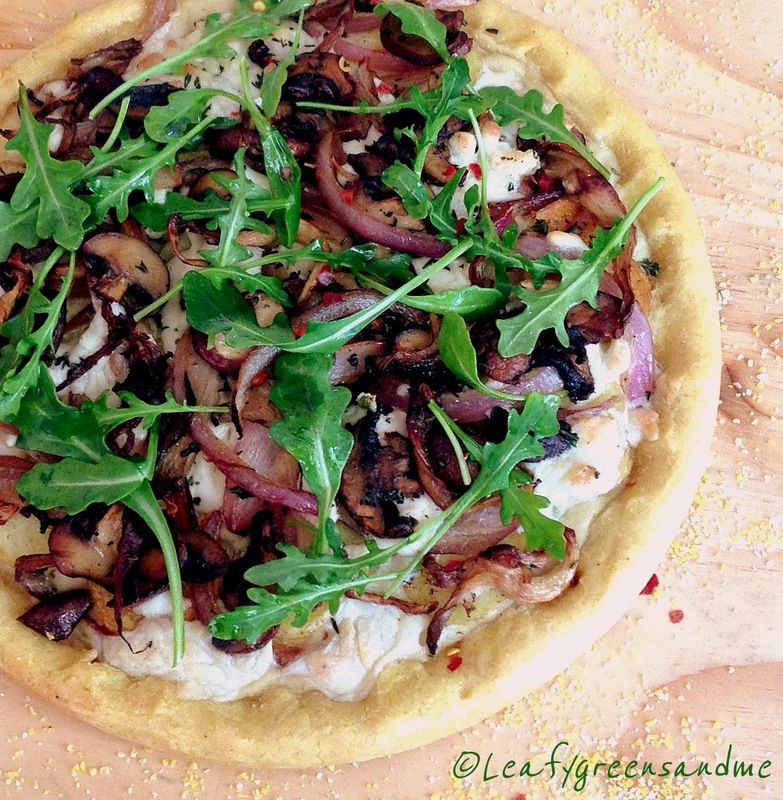 You can use whatever ingredients you like to make yours! I happen to like oven roasted tomatoes and briny olives and capers in mine. Serve it with a side salad of arugula, and shaved fennel, tossed with a balsamic vinaigrette and a glass of red wine--a perfect ending to a long work day! Now if it was only Friday! If you are using leftover pasta rinse to refresh it. If making fresh, follow package directions, drain and place in a large bowl. In a cast iron skillet, or non-stick skillet saute onions and bell peppers in olive oil until soft. Add garlic and crushed red pepper flakes and salt and pepper to taste and cook a few minutes longer. Add pepper/onion mixture to pasta, along with roasted tomatoes, olives, artichoke hearts, and capers and stir to combine. In a food processor or blender, blend tofu custard until smooth. You want it to be the consistency of thick creamy ranch dressing, but not mayonnaise. You may need to add a little more or less water. Taste and season with additional salt or turmeric if you want more color. Pour tofu custard over pasta/veggies and mix to combine. I did not use all of my custard--I had about 1 cup left over. Spray pan with a little oil and pour spaghetti mixture into pan and smooth with a spatula. Bake in the oven for 20-30 minutes until bubbly and set. Five minutes before removing from the oven, sprinkle with shredded cheese and bake until melted. Remove frittata from oven and let sit for about 5 minutes for custard to set. Garnish with basil and enjoy! On Sunday afternoons my husband and I used to head over to our local British Pub to watch the game, drink a couple of Harps and indulge in pub fare. He always ordered bangers and mash, or fish and chips and my favorite was shepherds pie! I cringe now thinking about how unhealthy we were eating. So now we still enjoy going to the pub, but we come home and I make our own favorites. 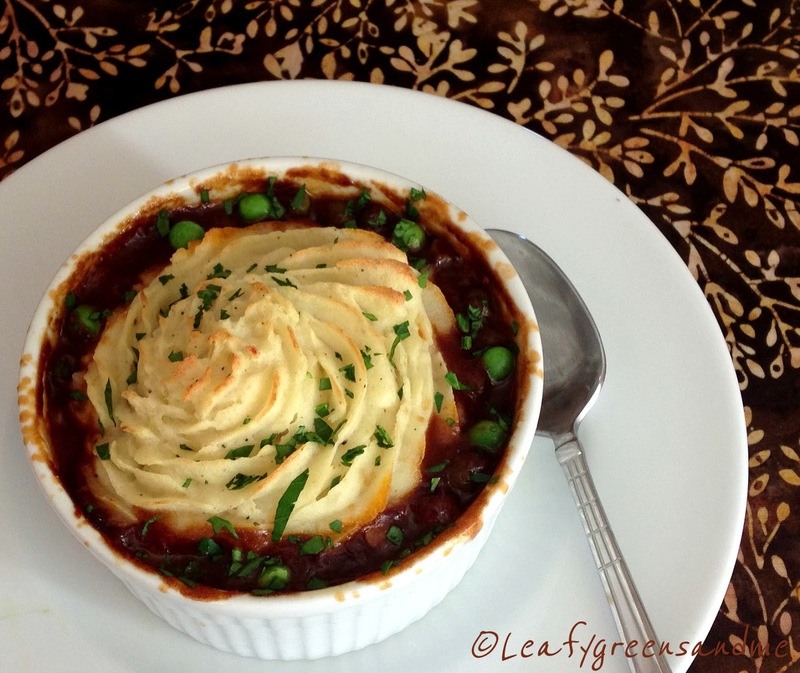 You can make shepherds pie with tempeh, seitan, TVP or just veggies, but I like using lentils. Lentils are full of fiber, iron and protein and are good for the heart! My favorite lentils to purchase are black beluga or French green lentils because they hold their shape during cooking. But my local market didn't have any and so I purchased the brown lentils instead. When cooking brown lentils don't follow the directions on the package and cook for 25-30 minutes because you will end up with mush. I bring four cups of water to a boil, stir in 1/2 cup lentils, bring to boil again, remove from heat, cover and let sit for 20 minutes--they are perfect every time! Look past my dirty oven (it gets used quite a bit) and see the ramekins bubbling in the oven, almost ready to come out. I add peas to the mixture, but I also like adding more when I pull them out of the oven for color and freshness. 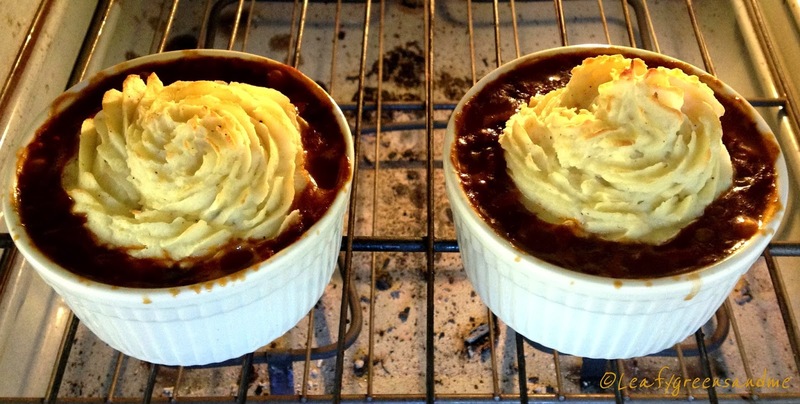 For the mashed potatoes, you want them to be stiff especially if you are going to pipe them into a design. If they are too loose they will spread out and deflate while baking. I used 3 medium sized organic russet potatoes, mashed with Earth Balance butter and cashew cream (see below) and nutritional yeast for a cheesy flavor. Finally, garnish with fresh parsley or chopped chives. Garnish with peas and chopped herbs and enjoy along with a cold Harp beer or a glass of red wine! And don't forget to turn on the game! There is a vegan tofu restaurant, well it's not really a restaurant but more of a carry out place near my house. They make all of their tofu handmade from scratch and they have everything from fresh tofu, to fried bean curd, to tofu skins, to textured protein, you name it--probably 50 different varieties of tofu and dishes which you can choose from. And it's all organic! No one speaks any English but you walk in and point to all the dishes you want and they wrap them up to go--in huge portions! I usually stop in there once a week when I don't feel like cooking and one of my husband's favorite dishes is the "Spicy Noodle". It is made with four ingredients: noodles, housemade textured soy protein, edamame and spicy chili oil. There is no way that I can walk into a restaurant and try a dish without coming home and making it and putting my own spin on it. I got this trait from my mom. Whenever we would go out to eat, or over to someone's house she would come home and make the dish and it was better than the one we tried. And I have to say Sogo Tofu that my dish is more flavorful, but what you do with tofu at your shop is amazing and I'm so glad that you're in my neighborhood! 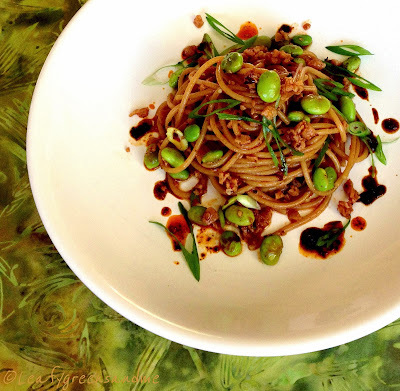 Note: You may want to add more or less teriyaki sauce and edamame once you toss the pasta all together--especially if you let the pasta sit for awhile because it will absorb the sauce. This dish can be served hot, room temperature or cold. I served my Spicy Noodle with a side salad of pickled watermelon radish, bokchoy, green onion and cilantro! Four year ago to this very day I switched to a Vegan Diet. It has been one of the best decisions that I have made in my life! When I started my journey I was 25 pounds overweight, my cholesterol was 260 and I had prehypertension, not to mention lots of joint problems from inflammation. Today my weight is a stable 125 pounds (I never diet), my cholesterol is 190, my blood pressure is 114/73 and I have no joint pain anywhere. The health benefits of eating a plant-based diet have been amazing for me and I will never ever, ever go back to eating any other way! I started my Vegan journey for health reasons, but it soon became apparent that there was something bigger and more important out there than me--the animals who suffer every single day of their lives because they have been turned into a horrible commodity for human consumption. I think about them all the time and my husband and I try to do our part in supporting organizations who try to help these animals and to end their suffering. I am also very conscience about what products I purchase. I don't buy leather, down, wool, silk, or use cosmetics, personal care or cleaning products that contain animal products or that are tested on animals. Some people may feel that my diet/lifestyle is very limiting and constrictive, but I feel the opposite. I live a full and wonderful life and feel great about my choices. I switched to a Vegan Diet to save myself, but I am thankful that I am able to do my small part in helping the animals and also our environment with one meal or dish at a time! Wishing and yours a very healthy, happy, prosperous and Vegan Delicious 2014!